A mysterious and reclusive entity since the mid-90s. Ooh Doof God has been submitted as a candidate track for Clan Analogue's Mobile Music compilation. This track was mostly recorded on a 4th gen iPad, using my own Fifth Degree: MIDI Sequencer app to sequence, track by track, instances of VirSyn's Tera and Cube iOS synths. Fifth Degree (wildcard prize winner in the 2014 KVR Developer Challenge), is a deliberately simple sequencer, monophonically rotating around the circle of fifths. The fun is in using this constrained sequencer to assemble more complex arrangements. It has a very useful live performance feature: velocity sliders for each of the 7 notes in-key in the circle of fifths, which means you can shift rhythmic emphasis while playing. Using this, the kick and high hats never repeat exactly, nor do the other elements. 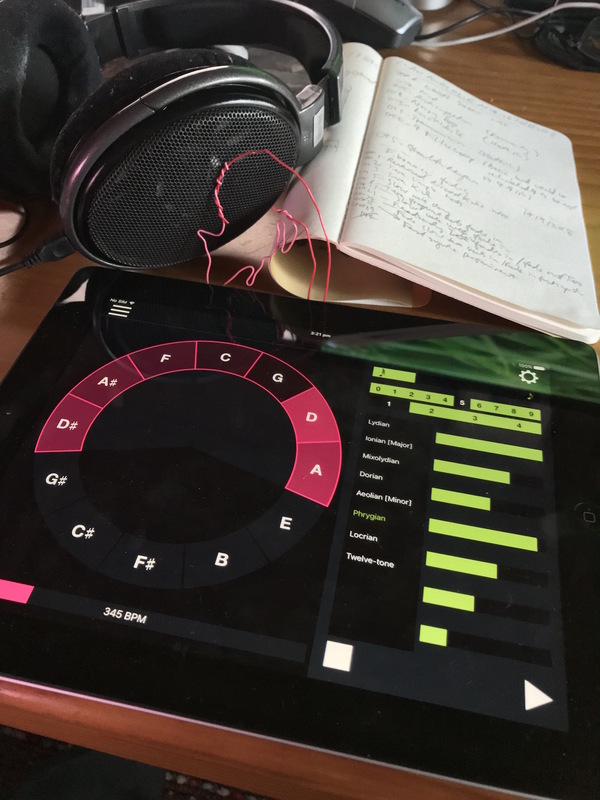 Each instrument was recorded into Garageband on the iPad, whilst live tweaking the note velocities, so each track is a performance in its own right. Then some of the tracks were imported into the Borderlands granular synth on the iPad, to generate some more raw material. The Garageband project was also copied onto an iPhone 7, so that some of the tracks could be run through the iOS version of Audio Damage's Discord 4 effect. All these raw and effected tracks were then imported into a more big-arsed DAW, where the performances were edited down and assembled into a composition. Only basic trimming, mixing, panning and on one instrument only some light EQ was done in the DAW.